I have suggested that the central question of moral philosophy as a whole, and of normative ethics in particular, is how one should live. I take this question to be sufficiently general that it is an open matter what an adequate answer would concentrate on. Plausibly enough, one might think that an adequate answer would primarily be concerned with issues about what one should do and how one should act. But one might hold that an adequate answer would concentrate instead on describing what kind of person one should be, rather than what one should do. And there are other possibilities as well. What are these other possibilities? And what is the precise difference between "describing what kind of person one should be" and "what one should do"? I don't understand this passage because it seems to me that "what one should do" covers everything. Here is my reasoning: "what I should do" covers all my actions. The things about me that I do not "do" are my current state, my involuntary behavior, and my internal involuntary reactions (e.g. my heart beating, spontaneous thoughts). I have no control over my current state; it's just how I am at the current moment. I can control my future state only via things I "do". Similarly, the only way I can control my involuntary behavior and internal reactions is also via things I "do" in the present (e.g. deep breaths to slow my heart rate) to change my current state and indirectly affect my future involuntary behavior. Because this behavior is involuntary I can never affect it directly. So it seems that "what kind of person should I be?" is the same as "what should I do?" since the only way I can affect what kind of person I am is by doing things. And everything I do affects what kind of person I am in the future. What am I misunderstanding about Kagan's claim that there are multiple possible focuses for answers to the question of how one should live? The distinction concerns what the object of normative evaluation is. On some accounts, the object of normative evaluation---the thing we praise or blame---is the action or the type of action itself. On other accounts, the object of normative evaluation is the character of the person doing the action. The former sort of theory will focus on the question "what should I do?" and the latter on "what kind of person should I be?" The canonical example of an ethical theory that focuses on "what kind of person should I be" rather than "what should I do" is Aristotle's virtue ethics. Aristotle argues that what gives an action moral value is that it flows from a fixed character trait. For Aristotle, it's not the type of action that is praiseworthy, but rather what kind of character trait underlies the action. So for example, it is not the act-type lying that matters, but rather it matters whether you're the kind of person who can reliably use your own practical judgment and recognize a situation in which lying might be the appropriate thing to do (e.g., when a crazed murderer knocks on your door looking for someone to kill). Whereas theories that focus on "what should I do" will try to find some proof that lying is wrong, Aristotle will look for the kind of character trait one should develop in which you use the character trait of honesty appropriately given the context. Thus, on such a theory, what counts is developing moral agency (i.e., being the right kind of person who can respond to a context-sensitive understanding), rather than determining from a theoretical standpoint what the right types of action are. The right types of action will vary by context, and what matters on Aristotle's theory is whether you're the kind of person who can read that context and respond appropriately and fluidly. You are correct to point out that what you develop your character traits by doing things. So for example you develop the character trait of bravery by doing brave things over and over. But for Aristotle the moral status of the actions that lead to the character trait are not on the same level as actions that flow forth from the character trait. Suppose you do a brave thing simply because your parents forces you to, and it pains you to do so. You have done the right thing, but for Aristotle your action has no moral value yet, because it didn't flow forth from the kind of person you are. For Aristotle, it is only once you have been habituated to acting bravely and take pleasure in doing so that your action is praiseworthy. Most anyone can be conditioned or programmed to behave according to society's (the majority's) wishes, and thus meet their approval while obtaining some level of tolerance and acceptance (doing, based on reward/punishment model). But happiness and free will requires a well-developed conscience for self-control (being, based on genuine -- as opposed to false -- pride). The moral sense theorists (Shaftesbury and Hutcheson) and Butler see all requirements to pursue goodness and avoid evil as consequent upon human nature, which is so structured that a particular feature of our consciousness (whether moral sense or conscience) evaluates the rest. Hume sides with the moral sense theorists on this question: it is because we are the kinds of creatures we are, with the dispositions we have for pain and pleasure, the kinds of familial and friendly interdependence that make up our life together, and our approvals and disapprovals of these, that we are bound by moral requirements at all. There is no precise distinction between 'what kind of person one should be' and 'what one should do' when discussing the morals of others, because we have no access to their inner experiences. The distinction is only apparent in reference to our own moral philosophy. What kind of person I should be refers to how my inner experiences such as attention, thoughts, decision-making and self-awareness should contribute to a sense of identity. What I should do refers to how this sense of identity should interact with the universe - my actions. If I determine that what I should do is always tell the truth and do no harm, then there will be occasions when I am conflicted, and the right action is unclear. With a focus only on actions, this area of moral philosophy is often influenced more by how actions are perceived in the community than by personal beliefs. If I determine that the kind of person I should be is honest and kind, then the right action may still be unclear, but I can recognise this inner conflict as evidence of my kindness and honesty, even before I act. Because the focus is not on actions but inner experiences, this area of moral philosophy is influenced more by personal beliefs and self awareness. So we can discuss what kind of person one should be, but any assessment of what kind of person one is can only be approximated by observing what one does, which cannot present the whole picture. Exploring or communicating inner experience, therefore, seems to be a crucial element of this area of moral philosophy. I haven't read Kagan's book, this is just my interpretation based on the small quote in the OP's question. Here is my take on this. "Being" is an internal trait, while "doing" is completely external; it doesn't matter how mean or greedy a person "is", the world around them is only affected by what they "do". A man could be outwardly kind and compassionate towards everyone, but inwardly only be doing it in self-interest, perhaps he has read some article somewhere that says that pretending to be kind is the best way to manipulate people. He goes to poor villages in African and helps build homes, but he doesn't really care about them, only goes so that he can sell them his new invention that allows them to filter dirty water. He helps a homeless man realize his potential as a movie actor (I'm just making up examples by the way) but then profits off him because he knows the homeless guy will be grateful and indebted to him for the rest of his life. On the other hand, a person could be like Batman, who outwardly is a rich stuck up jerk who often profits in ways that hurt other people, and that is how everyone perceives him, but in reality, he is a crime-fighting vigilante that truly cares about his city. However, notice the difference between the Batman example and the first example. In the first, I contrasted between what a man thought (bad) and what he did (good). In the second (Batman) I contrasted between what he seemed to do (rich jerk), and what he ACTUALLY did (fight crime dressed like a bat). Batman doesn't seem like a counterexample to the first example after all, does it? He still DOES GOOD, people just not know about it. The invisible hand is a term used by Adam Smith to describe the unintended social benefits of an individual's self-interested actions. Finally, let's take religious members of society that participate in religious missions and charity work daily. In "The Brothers Karamazov", (THIS IS NOT MY BELIEF, JUST ANOTHER EXAMPLE) Ivan suggests that people are only kept in check because of their fear of God. We can apply this same logic to these hardworking members of society, saying they only work for others because of their fear of death. That is, they believe that by being good they will reach immortality, and therefore want to work for the social benefit of everyone else: solely because it benefits them as well. Inwardly, they may be thinking "Ugh, I freakin hate these disgusting street kids" and "I sure wish they would all just get malaria and die" (allthough I said upward that this wasn't my belief, I really HAVE heard people say those exact words), yet they go on church missions to build schools in Central America. Are these still good people? To conclude, although there is a difference between who you are (inside) and what you do (how you affect the world), at the end of the day it doesn't really matter: it is only your actions that really determine whether what type of person you are. 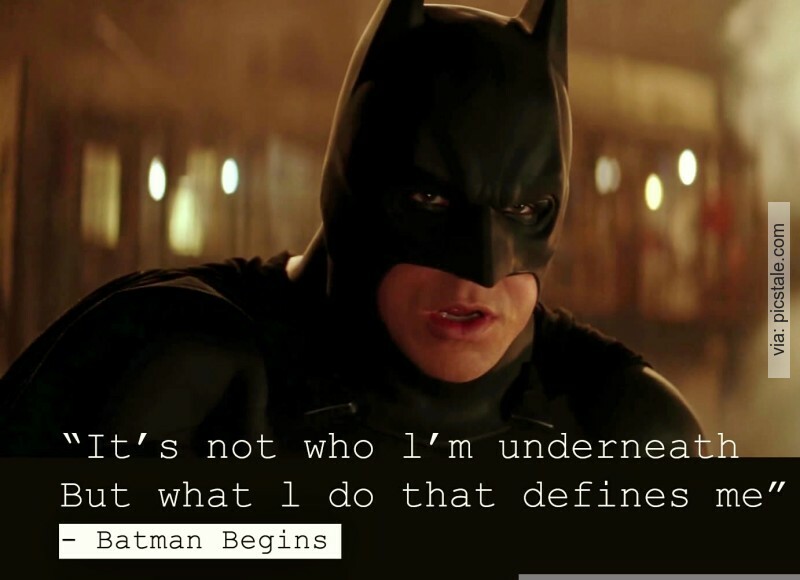 To quote Batman: "It's not who I'm underneath, but what I do that defines me"
Thanks for reading! Hope it was of use! Not the answer you're looking for? Browse other questions tagged ethics metaethics or ask your own question. Who applies the pessimistic induction to moral “truths”? What are the current leading theories of intergenerational ethics? What are the methods to evaluate a supernatural statement as carefully as possible? Is it a fallacy to argue or morally judge by treating earlier and later times as if in the same present?